Eye On Tampa Bay: Mysteries of central planning... revealed! Update: Late breaking news last evening - mystery company is Bristol-Myers Squibb but where they plan to locate is still a mystery...The location will be somewhere outside the city limits of Tampa - eliminating a number of those central planned EDA's. Not too long ago, the Hillsborough County Commissioners voted to use our tax dollars to help bring Bass Pro Sporting Goods store to Hillsborough County. Just yesterday the Hillsborough County Commissioners approved tax incentives to lure Amazon and a mystery company to come to Hillsborough County. Commissioner also gave final approval to more than $913,000 in tax exemptions for the next six years to encourage online retailer Amazon.com to build a $200 million warehouse in southern Hillsborough. Hillsborough County commissioners approved more than $2 million in financial incentives for an unnamed pharmaceutical company offering to create 567 jobs in the county. So Bass Pro is locating at Falkenburg and US-301, Amazon is considering the South Shore area and the mystery company's location remains a mystery. But what about the central planning efforts from our Commissioners to tie transportation and economic development together? And what about last years Economic Prosperity Stakeholder Committee (EPSC), as reported then by the Tribune, outlining yet another economic development strategy. The economic development strategies focus on setting aside land in the county for what are called Economic Development Areas. Those areas would be earmarked for transportation projects, and industrial prospects within those boundaries would receive incentives such as reduced fees and flexible development rules. The areas would be connected to other urban centers by mass transit corridors. So another committee was formed, with a taxpayer paid facilitator, to figure out what exactly to do with these proposed EDA's. 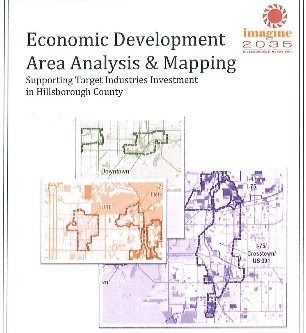 In addition, we found that the Hillsborough County Planning Commission already did a study in 2011 to recommend a strategic plan for economic growth that identified those EDA's. This study identifies and delineates potential Economic Development Areas (EDAs) based on the needs and characteristics of targeted industries and businesses. And in 2010, Tampa Bay Partnership and Tampa Bay Regional Planning Council received $540,000 of federal tax dollars from the Economic Development Administration, with additional funding from numerous local Tampa Bay area entities, to study future jobs. The studies will include implementation components to focus economic development and workforce resources to help the region create, attract and retain a higher skilled, better trained, more competitive, and innovative workforce. So we have paid for numerous studies, witnessed numerous committees and countless government planners, politicians and bureaucrats trying to wave their magic central planning wand. We've heard of incubators and medifutures and hints that we will need new revenue sources such as mobility fees or tax-increment financing (aka not free money) to fund these centrally planned EDA's. We don't know where the mystery company will locate. But what the Eye finds interesting is that neither Bass Pro nor the proposed site for the Amazon warehouse, both pursued by the Commissioners, are in an EDA, nor are an incubator or a medifuture. Perhaps the road to economic growth and prosperity in Hillsborough County doesn't require a path to funding EDA's.